One of the more successful US-friendly online casino operations is the Virtual Casino Group, which promotes the Cool Cat Casino. 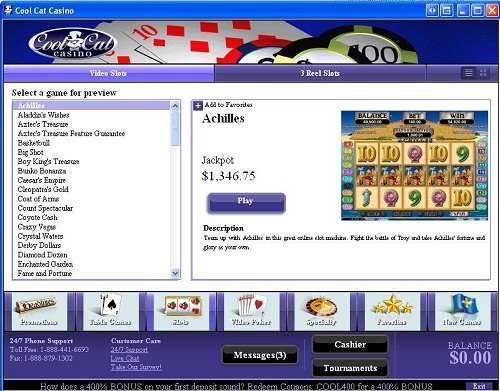 Cool Cat Casino runs the Real Time Gaming software, which is a very popular and well-liked software suite of games. Cool Cat Casino accepts players from around the world, including the United States. Click here to redeem at the Cool Cat Casino! To redeem the bonus code of your choice, first visit the Cool Cat Casino and download the casino software. Next, install and launch the software, then click “New Account” and register your account. Now visit the Cashier and fill out the required information. You will only have to do this once. Cool Cat Casino has a lot of different bonus codes, many of which are unpublished or very difficult to find. We recommend the codes listed on this page. Below you can find details on our top 5 Cool Cat bonus codes. The bonus code 100NDBNCC provides a $100 free chip to both new and existing Cool Cat customers and there is no deposit required to receive your $100 free chip. You are limited to playing only Slots and Keno games with your free chip. There is a 30x wagering requirement, so you will have to play $3,000 total to satisfy the requirement. The $100 free chip itself cannot be withdrawn, however any winnings you’ve earned after wagering the $3,000 is yours to keep. The $100 free chip amount will get deducted from your withdrawal amount. The maximum amount you may cash out from just playing the $100 free chip is $100. Even with these limitations, make no mistake, this is an awesome promotion. You can play with $100, at no risk, with a chance to cash out up to $100 in profits! After receiving your $100 Cool Cat no deposit bonus, you will need to make a deposit before you can claim another no deposit bonus code. Cool Cat does not allow you to redeem two no deposit bonus codes back-to-back. The bonus code 300NDBN provides a 300% initial deposit bonus with no upper limit on the bonus amount, no wagering requirements, and no maximum payouts!!! However, you may ONLY play slots games and keno when electing this bonus. There is a minimum $30 deposit to qualify for this promotion. And the bonus amount is “sticky”, meaning the bonus amount will get deducted from your withdrawal. Now that you’ve made a deposit and hopefully cashed out some winnings, you can take advantage of another Cool Cat no deposit bonus code! Visit the Cashier and redeem the no deposit coupon code 25BANKROLL and receive a $25 free chip. The rules and requirements are identical to the $100 free chip offer – you may only play Slots and Keno, there is a 30x wagering requirement, and there is a $100 maximum cash out. Still, it’s $25 free so go get it! As mentioned, you have to alternate between no deposit bonus codes and deposit bonus codes. So this time, we recommend redeeming the coupon code COOLWELCOME – which offers a 330% bonus plus 50 free spins on their slot game Popinata. This bonus is excellent because it only has a 5x wagering requirement! You may only play Slots and Keno with this bonus and there is a minimum $50 deposit to qualify. And there is no wagering requirement on your 50 free spins! Finally, our last Cool Cat coupon code that we recommend is another no deposit bonus – redeem the code TWOWISHES and get a $15 free chip plus 20 free slot spins! There is a 30x wagering requirement on Slots and Keno and a $100 maximum cash out – just like the other no deposit bonuses. Additionally, there is a $400 required play thru on your 20 free slot spins. Cool Cat offers over 130 games! If you like slots, then you’ll like the Cool Cat Casino. With over 100 slot games, you have endless options for fun. Cool Cat has some classic looking slot games like Fruit Frenzy, Sevens and Stripes, Caesar’s Empire, and Cleopatra’s Gold. For all you blackjack fans, Cool Cat offers several variations. In addition to standard Blackjack, Cool Cat also has European Blackjack, Perfect Pairs, Face Up 21, Pontoon, Match Play 21, and Super 21. A nice feature offered to Cool Cat customers is the loyalty program. Cool Cat automatically rewards all players with comp points based on the amount of their play. Comp points can then be converted to bonus cash! 1 comp point equates to a $1 bonus! You must contact customer service to convert your comp points to bonus money. Also note that the comp point bonuses are still subject to wagering requirements. Get lucky at the Cool Cat Casino! Find the latest Cool Cat Casino no deposit bonus codes at USA Casino Codes. For a completely unique online casino experience, why don’t you try playing with real live dealers! Learn more at LiveDealerSites. If you like Texas Holdem, check out the US-friendly Americas Cardroom. Download Americas Cardroom here and find all the latest Americas Cardroom promotions at AmericasCardroomBonusCode.com. For online poker, we recommend checking out the new Ignition Poker at http://gpsts.org/ignition-poker-bonus-code-review/.